My demons battle each other constantly, the one who thrills to Vegas style lights and the other whose dream is to be “off the grid.” To exist on solar and wind power would be the ultimate to demon # 2. Demon #1 encourages those who set the electric meter spinning by electrifying Christmas in their front yards. If we didn’t pile in the car like a bunch of Oakies on the way to California, would they do it? I don’t know, but the Yuletide Galaxy ends at our house. We decorate, just not luminously. Not until this year! Jerry craved a fat, woodsy smelling tree, to replace our slim artificial. So, this is his year. Today we brought the most beautiful once-live tree home. It would have LED lights. They save up to 90% in electrical usage over regular bulbs. So why not put them on the firebush out front, too? But that is not what is happening. 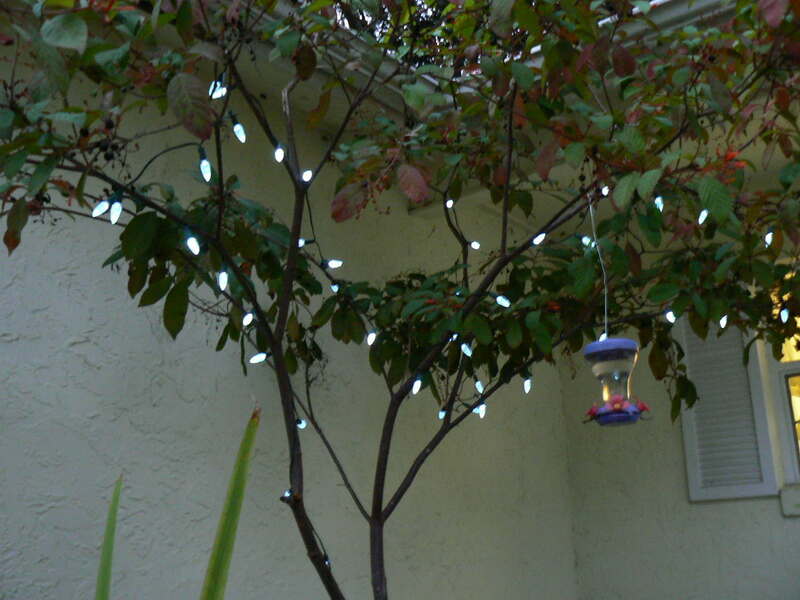 While searching for outside LED mini-lights I run into –be still my heart – outdoor solar mini-lights! Zero electricity! The instructions said it would take 6-8 hours to charge the batteries behind the solar panel. Two cloudy hours later the firebush lit up. You would think we were wildcatters observing a gusher. We could not believe it. The glow is rather faint, but Jerry assures me it will be brighter after an all day charge tomorrow. Of course, we haven’t yet gotten over the miracle of the sun setting our water fountain in motion. We are easily entertained. So now I’m thinking of a huge lighted wreath between the front windows, maybe light the crepe myrtles at each end of the house. How about down by the pond reflecting off the water? All this would require no electrical cords snaking through the grass, no meters spinning out a January surprise in the power bill. It may not be easy being green, but it is getting easier.